You can find best hotels selection near Hyères (TLN) Airport below. Its provide by Booking.com the most popular Hotel booking sites with over 130 000 affiliate best hotel in the world. This seaside hotel sits in an 8-acre park and overlooks the Golden Islands. It offers en suite rooms with TV, just 2 km from the port of Hyères. The hotel?s buffet restaurant, Les Iles d'Or, serves traditional cuisine. Ideally set on the Port Saint Pierre, the hotel and restaurant Les Voiliers welcomes you in the very heart of Hyères. It features 37 air-conditioned rooms with their own balcony. 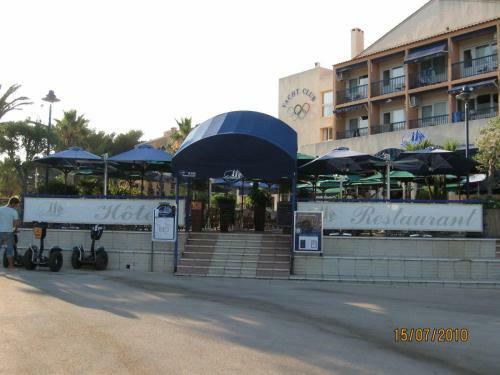 This hotel is located in the city centre of Hyeres, just 4 kilometres from the airport, beaches and port. Mercure Hyères Centre features 84 air-conditioned and soundproofed rooms, a terrace, a swimming-pool and a garden. This hotel is located in the historical, medieval centre in the town of Hyères. It offers soundproofed guest rooms with free Wi-Fi access and a TV with satellite channels. Each guest room has a private bathroom fitted with a hairdryer. This charming family hotel set near the marina welcomes you just few metres from the beaches for a leisure or business stay on the Mediterranean Coast. Standing on 12th-century ramparts in the hills of the old castle, this ivy-covered Provencal cottage is within easy reach of Hyères, the St. Bernard Garden and the sea. The Citotel Hôtel Du Soleil is a peaceful and charming hotel.